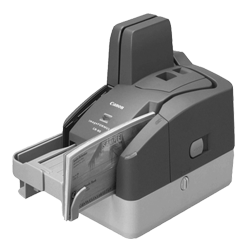 Canon CR-80 Scanner This scanner is big on advanced front-office functionality while its ultra-compact size means it easily fits into most spaces. Excel in front counter or remote capture environments. Tipping the scales at 2kg, the CR-80 is very light, and its small stature ensures the machine sits comfortably on the smallest of desks or counters. With the CR-80 by your side, it is easy to scan in high quality at a class-leading 80 cheques per minute respectively, using black & white and grayscale image reading.